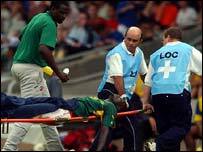 News of Marc-Vivien Foe's death on Thursday has stunned Cameroon's football community. Celebrations following their 1-0 win over Colombia in the Confederations Cup semi-final were cut short, as a sober mood gripped the nation. Fans and government ministers have been visiting the family residence of the fallen hero in the capital Yaounde to pay their last respects to the fallen star. Foe's family home is close to the Ahmadou Ahidjo stadium, where Foe began his international career with the Indomitable Lions in 1993. State President Paul Biya has sent a message of condolence to the bereaved family and the national team. Biya's message was taken to Foe's father by Jean Marie Atangana Mebara, the secretary- general in the presidency. Atangana and the other ministers met a sad atmosphere at the house, as groups of women and children were weeping over the loss of their son and brother. A picture of Foe with the national team, taken after their African Nations Cup triumph in 2000, was hung on the main door. Another photograph showing Foe receiving a medal from President Biya was displayed in a sitting room reserved for fans. Foe's mother, wife and three children are currently in Lyon. Fans that gathered in groups to discuss the tragedy said Foe's loss was a terrible blow. It was the major topic of phone-in radio and television programmes in Yaounde, with music being played to reflect the sad national mood. "This is unbelievable. How could an able-bodied adult collapse and pass on so easily,?" one fan questioned. A lady fan pulled off her headscarf and shouted: This is a catastrophe. I feel like going mad." The decision of Cameroon's Football Federation to play in Sunday's final against France has provoked a mixed reaction amongst the populace. But the prevalent view is that the Indomitable Lions should win the Confederations Cup as a fitting memory to the fallen star.